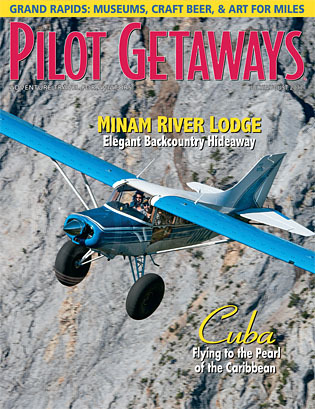 This issue has a special feature: an article about flying to Cuba! Since U.S. diplomatic relations with Cuba were resumed under the Obama administration, many general aviation pilots have considered flying there. Here’s your chance to read a first-hand report of what it’s like, and learn specifics on how to fly there yourself. We offer some additional other grand destinations, too. Specifically, you can fly to Grand Lakes or Grand Rapids for outdoor recreation or an immersion in world-class art and culture. Finally, we’ll take you to a brand-new, remote wilderness lodge. No, it’s not in Idaho or Montana. This one is in Oregon, and you’ll want to visit next summer for sure! Deep within eastern Oregon’s Eagle Cap Wilderness, a spectacular new fly-in lodge has arisen—the Minam River Lodge. First opened nearly 70 years ago as a hunting lodge, the property has been thoughtfully reimagined as an elegant hideaway filled with handmade touches by local artisans. Visit this remarkable gem with Managing Editor Crista V. Worthy, who says that the new Minam River Lodge can more than hold its own with the most venerable, remote fly-in lodges of Idaho and Montana. Accessible only via airplane, horseback, or on foot, you’re assured of an experience immersed in nature. Hike, fish, or go horseback riding in the beautiful Wallowa Mountains. The Lodge’s own distinctive cuisine is based on meats and produce from local farms and the Lodge’s own onsite garden. Amenities include a wood-fired hot tub and rustic sauna, each just steps from the wild and scenic Minam River. The Lodge is operated by a devoted staff of outdoor enthusiasts, all of whom are paid a living wage and share with the owner in any profits. Within the Lodge, you’ll discover artwork made by generations of eastern Oregon craftsmen and artists. Even the furniture and dishes were locally-made. Every detail of the Lodge is designed to honor the surrounding wilderness and minimize environmental impact. Stay in a lodge room, cabin, wall tent, or teepee and see for yourself! For nearly 60 years, American policy has, for the most part, prohibited U.S. citizens from traveling to Cuba. During the Obama administration, however, the prohibition was lifted and direct flights from the U.S. to Cuba, both via the airlines and general aviation, were allowed, with some restrictions. Late last year, Pilot Getaways Publisher George A. Kounis flew to Cuba in a Piper Malibu Mirage… a trip he had looked forward to for years. Along with his two friends, the Mirage owner Robert DeLaurentis (also known as Zen Pilot) and Jiri Marousek, the trio had an excellent Cuban adventure with plenty of excitement, stops at two airports, and even a scuba diving experience in the infamous Bay of Pigs. Yes, it was all there: the colorful and historic buildings, the exuberant people, and the classic American cars. And they can’t wait to go back! For years, pilots in the know have made Grand Lake o’ the Cherokees (known locally as Grand Lake) one of their top Midwest recreation destinations. As author MeLinda Schnyder explains, the enormous lake boasts 1,300 miles of scenic shoreline stretching southwest to northeast in the corner of Oklahoma that borders Kansas, Missouri, and Arkansas. The area offers activities of all types: on land, water, and air. You can even get a seaplane rating right here in a beautiful Lake amphibious airplane; brush up on your seaplane skills, or try a flying boat for the first time, and get that BFR signed off for another two years. The CFI even has accommodations for students and their spouses. Other fun activities include fishing, boating, parasailing, and water skiing. Golfing is a year-round activity here, and you’ll have six golf courses to choose from. Visit the pioneer-era village and history museum or the hot rod and custom car museum, take a drive on Route 66, or visit seven themed gardens. Grand Lake resorts, including one with its own runway, ensure you’ll sleep and dine in style. Grand Rapids boasts an internationally-recognized arts and culture scene, and there’s no better time to experience it than each fall, when the city hosts the world’s most-attended public art event: ArtPrize. As author MeLinda Schnyder explains, the 19-day event attracts the best artists from around the world by offering large and diverse audiences and paying out the biggest art prizes: one $200,000 award is decided by public vote, an equal prize is chosen by expert jury, and an additional $100,000 is awarded to the top entries in various categories. MeLinda reveals how ArtPrize has been integrated into the city’s culture year-round, as a number of the artworks initially displayed during the festival end up becoming permanent additions to local parks, offices, and museums. Grand Rapids’ most famous residents were U.S. President Gerald Ford and his wife Betty. The Gerald R. Ford Presidential Museum, which transforms its large lobby into an art gallery and hosts outdoor installations during ArtPrize, makes a worthy stop. Additional attractions include an enormous downtown market for all things Michigan-made, the Beer City Ale Trail, and a vast sculpture park and garden. Flying to Grand Rapids becomes even more attractive, since the city provides shuttles to art venues, making transportation a breeze during ArtPrize. Also, in addition to their luxurious accommodations, a number of fine downtown hotels offer easy access to the art installations. Add fine dining and plenty of nightlife, and Grand Rapids reveals itself as a grand place you should fly to rapidly. To complement our article about flying to Cuba, this month’s Flying Tips helps you brush up on the ins and outs of international flight. Since 2004, Rick & Pia Hilbert, owners of Caribbean Sky Tours, have assisted pilots who want to explore Mexico, The Bahamas, Caribbean, and Central and South America via general aviation. They have shared some of their extensive expertise here, so you can effectively plan and carry out your international dream vacation. Topics covered include flight planning, tips for passengers and crew, U.S. departure procedures, operations in foreign countries, returning to the U.S., and other considerations. Making an international flight can be intimidating, but the information in this issue can help arm you with what you need to be able to live your dream!